Just because you read books doesn’t mean you go to bed early. As the day’s events at Edinburgh Book Festival wrap up at Charlotte Square Gardens Jura Unbound throws open the canvas to the Spiegeltent to entice you in for a night of live literature, spoken word, music and surprise antics. A night of international short stories with Denmark’s Dorthe Nors (Karate Chop), Ireland’s Mary Costello (The China Factory), USA’s Molly Antopol (The UnAmericans) and David Gates (A Hand Reached Down to Guide Me). A blend of story and song from Colin MacIntyre, of Mull Historical Society, with his debut novel The Letters of Ivor Punch; author and musician John Darnielle (Wolf in White Van); and Etgar Keret (The Seven Good Years). An evening of scandalous musical history with journalist Stuart Cosgrove (Detroit 67) and Wyndham Wallace (Lee, Myself and I). Wed 19 Aug: Head North, My Friend! Authors Ragnar Jónasson, Jessie Kleemann and Niillas Holmberg present work from Shetland, Finland and Iceland. Hosted by Ryan Van Winkle. Children’s author Julia Donaldson performs folk songs with her guitarist husband before the pair initiate an audience game of Squash and a Squeeze. If you have kids you’ll know what to do. Babble On co-producers, BIGMOUTH present an eclectic evening of performance with music from Art Brut, poetry from Jemima Foxtrot and Luke Wright, a game of Ringo: Music Bingo and Eddie Argos with his spoken word show, Formed A Band. Literary cabaret HOMEWORK celebrate 800 years of the Magna Carta with Ross Sutherland, Molly Naylor and Joe Dunthorne. The Skinny magazine get their tenth birthday celebrations underway with novelist and former Skinny writer Sean Michaels. Authors Dan Gunn (The Emperor of Ice Cream) and Italian writer and translator Massimo Bocchiola, who translates Irvine Welsh’s novels, are joined by Italian folk group The Badwills. Spoken word group Illicit Ink present their unique brand of sinister storytelling. TV presenter, journalist, musician, radio broadcaster and author (Songs In The Key of Fife) Vic Galloway showcases the Scottish indie scene with a host of debut novelists and musicians. Thu 27 Aug: Neu! Reekie! The Edinburgh collective host a fusion of avant-garde spoken word and music. Writers Marlon James (A Brief History of Seven Killings), Ryan Gattis (All Involved) and Lisa McInerney (The Glorious Heresies) read their gritty stories set in urban spaces. Graphic novelists William Exley, Andy Poyiadgi and Joe Sparrow lead an interactive night of creativity as part of the festival strand celebrating graphic novels and comics. The dynamic duo of Rally & Broad use a variety of cross-disciplines to explore how we interpret words. Mon 31 Aug: Bang! Bang! Jura Unbound finishes with a bang. Later start of 10.15pm. 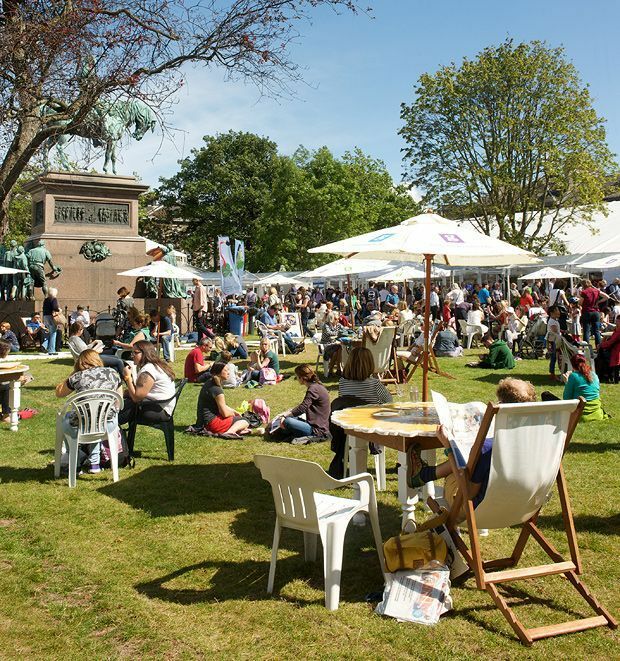 Jura Unbound, Spiegeltent, Charlotte Square Gardens, Edinburgh International Book Festival, Sun 16–Mon 31 Aug, 9pm, free.